The Bolivian president has abandoned plans to introduce a new income tax after violent protests left at least 10 people dead and dozens injured in the capital, La Paz. Gonzalo Sanchez de Lozado announced his decision after troops and striking police officers fought each other outside the presidential palace. "I have decided to withdraw the budget bill that I sent to Congress," he said in a televised address to the nation. Local media say eight policemen and two soldiers were killed in Wednesday's violence in the impoverished Latin American state. The trouble appears to have erupted when demonstrators outside the presidential palace threw stones at the windows as police looked on. The soldiers guarding the building opened fire with tear gas and live bullets, eyewitnesses said. 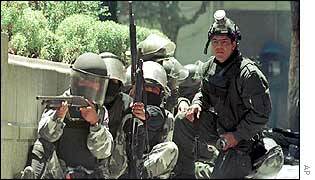 Unrest began earlier in the week when police units in La Paz refused to go out on patrol over a demand for higher wages. About 10,000 officers - nearly half of the nation's police force - refused to go on duty. The government's announcement of a new income tax of 12.5% - necessary, it said, to reduce the deficit and win IMF support - only added fuel to the fire. One restaurant owner, Sonia Rocha, denounced the government's economic plans. "We're living a total chaos," she told the Associated Press news agency. "The government should really have thought before announcing these new taxes. We're just too poor to pay them." Unions, employers organisations and opposition politicians have threatened a general strike over President de Lozado's austerity policies. The BBC's South America correspondent, Tom Gibb, says it is still unclear whether the president's climb-down on Wednesday will be enough to stop a general strike. "The president has now backed down"